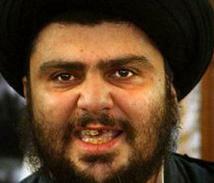 Radical Iraqi cleric Moqtada al-Sadr returned to Najaf this week after a three year stint in Iran. Al-Sadr fled Iraq in 2006 or 2007 after an arrest warrant was issued for him. Already he is urging Iraqis to oppose the US. Iraqi Shi’ite cleric Moqtada al-Sadr urged a sea of rapturous followers Saturday to resist all occupiers of Iraq and oppose the United States, but not necessarily with arms. In his first speech since his homecoming Wednesday after years of self-imposed exile in Iran, the one-time firebrand burnished his anti-U.S. credentials and urged supporters to give Iraq’s new government led by Shi’ite Prime Minister Nuri al-Maliki a chance. “We are still fighters,” said Sadr, who led two uprisings against the U.S. military after the 2003 U.S.-led invasion and has called for an earlier U.S. withdrawal than the agreed deadline of the end of this year. He labeled the United States, Israel and Britain “common enemies,” and demanded that the Iraqi government, in which his movement will play a major role, honor a promise to end the U.S. occupation this year, as agreed. Would someone please explain why this terror leader is still alive?